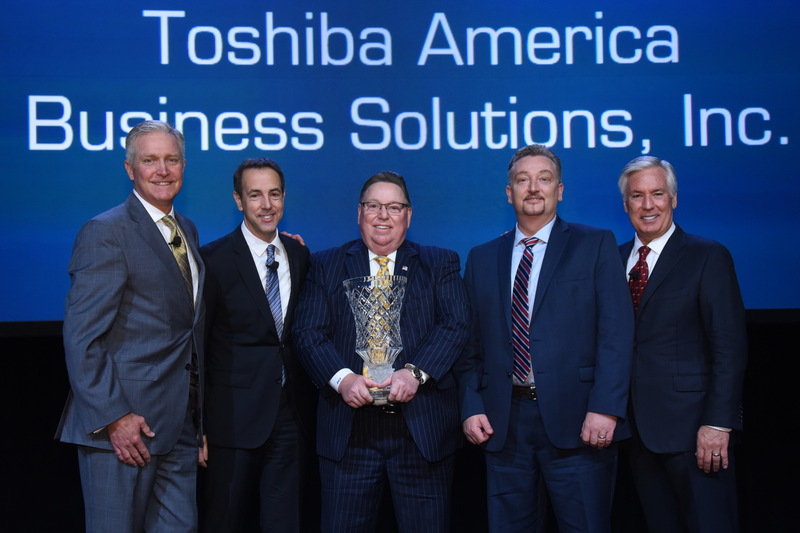 Toshiba America Business Solutions recognized seven of its top-performing U.S. independent resellers with Dealer of the Year recipient, Cincinnati's Donnellon McCarthy Enterprises leading the list. Toshiba also recognized Harrisburg, Pennsylvania-based Higher Information Group as its All Star reseller with first-year dealer partner, The Lioce Group in Huntsville, Alabama earning Rookie of the Year honors. Toshiba additionally honored the following resellers as its top regional dealers: Appalachia Business Communications (Southern region), James Imaging Systems (Midwest region), Nauticon Imaging Systems (Eastern region) and Kelley Imaging Systems (Western region). "In addition to their collective stellar sales performance throughout 2016, all of our award-winning resellers have opened up their wallets and rolled up their sleeves to better their communities," said Toshiba America Business Solutions Senior Vice President Sales Americas, Larry White. "Whether volunteering at food banks, giving money to worthy nonprofit organizations or even starting their own nonprofit, the seven resellers we've chosen are clearly making a difference where they live and work." Donnellon McCarthy Enterprises was acknowledged for its exceptional nationwide revenue, percentage of sales quota met, year-over-year revenue growth and community service. Toshiba's four regional award recipients were similarly recognized for the same criteria on a regional basis. The Higher Information Group received All Star honors for significant sales growth within all of Toshiba's product groups, which include the company's e-STUDIO™ multifunction printers, Ellumina™ digital signage and thermal barcode printers. The Lioce Group earned Rookie of the Year recognition for most revenue for a first-year reseller.